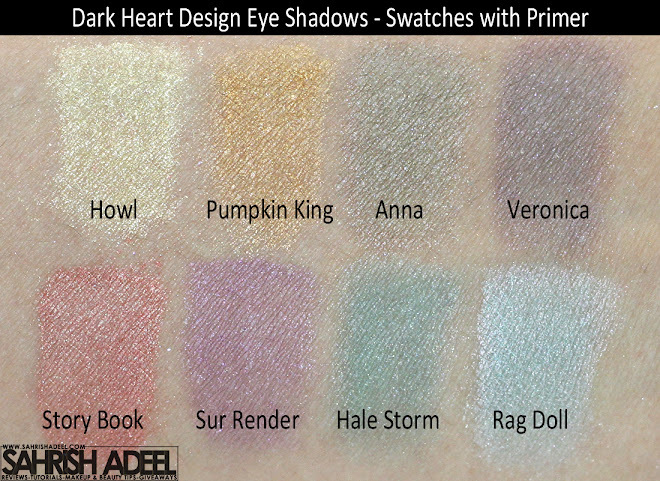 Dark Heart Designs Loose Eye Shadows - Review & Swatches | Sahrish Adeel - Malaysia based Pakistani Beauty & Lifestyle Blogger! People are getting into vegan makeup/tools these days. Dark Heart Designs make vegan makeup (except for a few items) and claims that none of their product is tested on animals. Let's see how I found these eye shadows. Each shadow comes in a round 3 gram tall profile sifter jar and holds 1.5 grams of loose powder eye shadow pigments. The samples I got were in sample packaging and each sample bag carries 0.25 gram of product. Dark Heart Designs sells their cosmetics both in full sized and sample packaging which I think is a great way to try more products by spending less. Good color payoff on top of an eye primer or eye shadow base. Stay on without creasing or toning down for 5-7 hours if applied over an eye primer or eye shadow base. These eye shadows are shimmery but the shimmer is really fine and looks really great. Can be used as blush, highlighter or on nails. Huge color range and the best thing, you can get these in full size or in sample size. Fall outs even with much care. Howl is a pale yellow shade with dull gold shimmer. It looks good on face if used as an highlighter. 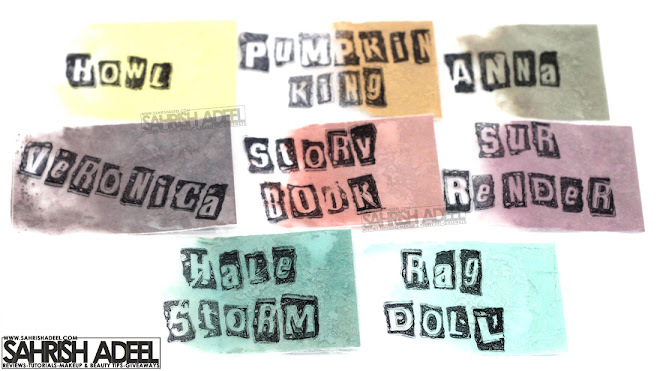 Pumpkin King is a bright orange shimmery shade. Anna is a very light olive green shimmery shade. Veronica is a light but deep purple shade with plum shimmer and green undertone. Story Book is a peachy shimmery shade. It looks nice as a shimmery blush. Sur Render is a purple shimmery shade. Hale Storm is an aqua shimmery shade. Rag Doll is a light blue shade with very fine silver shimmer. To be honest, I am not a huge fan of shimmery eye shadows. I do like them occasionally but in combination with matte ones. When I got these eye shadows I didn't know how they would look but surprisingly, they looked amazing on eyes. The reason for this in my views is the extra fine shimmer they contain. On each application, you would go wow. The shadows look brilliant if applied over an eye primer or eye shadow base. I tried these over Professional Eye Primer by MUA (review here) and then over NYX Jumbo Pencil (review here). The difference was not much among both applications but with eye primer, they stayed for longer hours. The only thing I did not like about these eye shadows was the fall outs. For me, fall out from a shimmer shadow is worst than the fall out from dark matte shadows like black and blue. I also tried using Shadow Shields (review here) but there is still some shimmery fall out right below the lower lash line. Overall, these eye shadows are good to have in collection. They would look good as it is but layering them over a dark eye shadow base would look pretty nice as well. If you are into hand made eye shadows and looking for shimmery eye shadows, you should give these a try. You can get a 20% discount on your order, with no minimum purchase if you will use the code 20off. Each sample sized eye shadow costs $0.99 and full sized costs $5.99 from their website here. The good thing is that their shipping charges are really reasonable and they ship worldwide. What kind of eye shadows do you like? Matte or shimmer? Share with me. For more reviews on eye shadows, click here.